So lately we've been having really gloomy mornings in LA. That whole overcast marine layer thing--I don't even know what a marine layer is, I only know that it goes away at 12 noon here. I have a windowless office which makes mornings a little glum, and my skin really pale (or as pale as my Puerto Rican olive skin can get). So today I'm posting some pretty pictures to make me, and hopefully you happy. This room is so great. Look at the gorgeous green kantha quilt--its textured and has an incredible diamond pattern on it. I'm a total sucker for patterns like this made out of shapes because it makes me feel like I can create my own pattern for fabrics with out having any insane drawing abilities. 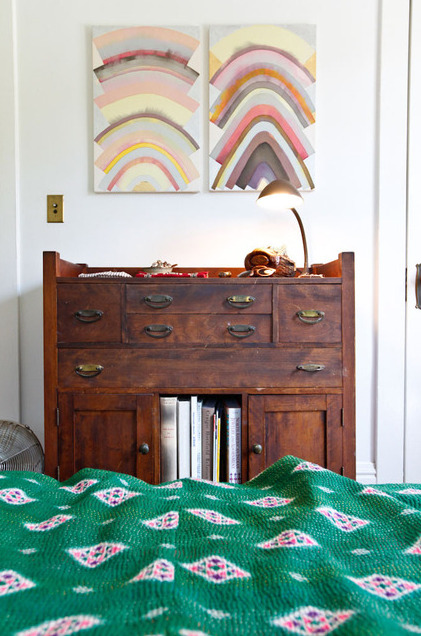 The pastel paintings on the wall complement the pink in the hues in the quilt, and oh MAN, look at that cabinet. It is all sorts of amazing, rustic, an antique, beautiful hardware that definitely looks original...I want this piece in MY room! OH, I cannot say enough about this living room shot. The ikat settee? The brass floor lamp? Crazy painting? Okay. 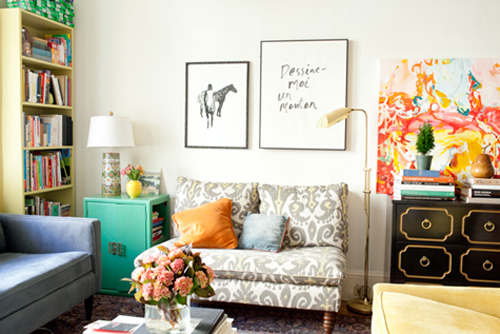 I love me some ikat, and that settee is so super cute. I have a super eclectic style when it comes to decorating my home (and myself) so its always encouraging to see so many different styles work together. I also love color, and that great little turquoise side table, plus the awesome painting to the right is just the right amount of bold pop. I've been riding horses my entire life, so naturally I am drawn to almost anything with an equestrian feel (and flat out horsey in general). I'm not a huge fan of black furniture, but that console with the gold accents works perfectly with that floor lamp. Ohhhh talk about making me happy. 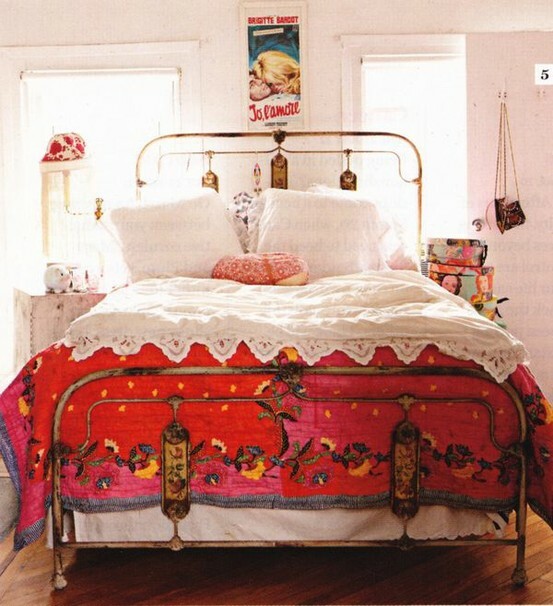 The antique wrought iron bed frame--I love how tall it is and when you look closely you can see how ornately it was made. Pops of red all over the room here, and SUCH an awesome quilt. Overall this room feels so vintage awesome I can't get enough of it. Did you notice the crocheted edges on the bed too? So feminine and such a pretty touch.